Yesterday, a gloomy and rainy day in Stockholm, and with the suburb train situation messed up, I felt generally depressed. How to feel better? 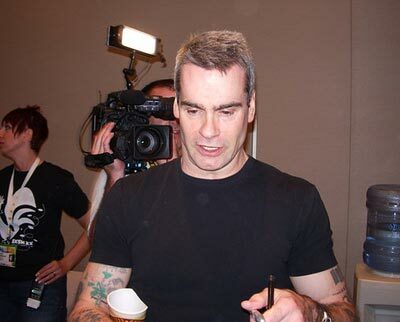 With some humor and aggression, of course, and what better way to find that than watching Henry Rollins in Stockholm! Actually, sitting on the train, which was way late, I browsed through one of the free morning papers handed out everywhere. I turned the page and, lo and behold, Henry Rollins was making a spoken word performance in Stockholm the very same evening! Cursing myself for missing this, I called my brother and asked if he could get some tickets online, but apparently there were only available at convenience store resellers, since it was the same day as the event. I went by one on my way to work (in the puring rain), and yes, they had two tickets left! I’ve seen Henry perform two times before, in Stockholm 2001 at GÃƒÂ¶ta Lejon and in 2005 in Rival, both times outstanding. I also had the luck of actually meeting him and talking a little at SXSW in Austin in 2006, so I really didn’t want to miss this evening. I think Henry was in good form, and he always performs these killer sets that get close to three hours long. This time, in the same Venue as last time, Rival, he did an encore, which I haven’t seen before. Lots of good stuff in it, by then he was all worked up and excited. Overall, the show was good, but it also felt different to the previous ones I’ve been to. He was actually less serious this time, and he had completely new ideas and schemes; I love it when performers evolve! However, and this might probably offend Henry to no liking: he actually seemed happy. He was smiling and the tone in his stories was generally more positive, no matter how hard the punchlines were. In some weird way, it felt like he has fallen in love. But fret not! The show was still filled with aggression and disliking for various things in our world that are fucked up, so we definitely got our well-needed dose of rants. Thanks for a great night after a rather lousy day, bro. Your review is pretty much spot on! I've been to the show at the Rival too. Just like you, it's the 3rd Spoken Word Show of HR, I saw. First one back in 1999. Interestingly, your review talks directly from my mind. The show seemed different to me – and surely it was. The stories he's telling have always been personal, since they represent his experiences, but this time it was just somehow one step beyond this. I think he also was more into the crowd than usual. Maybe this was the reason for the encore. Things change over the years, so do people. And that's not a bad thing at all. I'm glad that I was allowed to be at the show. Thank you for your review! Yeah, liked it too. Some thinks he went on too long with his ramblings, but as I don't suffer from Adult Short Attention Span Disorder I can take hours of Henry and was actually bummed when he walked out after just 2+ hours – but the encore made up for that.